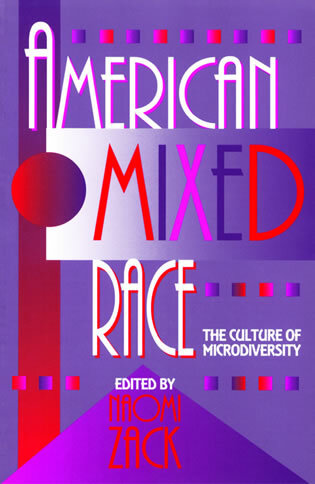 This exciting multidisciplinary collection brings together twenty-two original essays by scholars on the cutting edge of racial theory, who address both the American concept of race and the specific problems experienced by those who do not fit neatly into the boxes society requires them to check. Linda Alcoff, Debra A. Barrath, Jennifer Clancy, Susan Clements, F. James Davis, Abby L. Ferber, Carlos A. Fernandez, Freda Scott Giles, David Theo Goldberg, Susan R. Graham, Helena Jia Hershel. M. Annette Jaimes, Cecile Ann Lawrence, Zena Moore, Maria P.P. Root, Laurie Shrage, Stephen Satris, Carol Roh Spaulding, Mariella Squire-Hakey, Teresa Kay Williams, Bruentta R. Wolfman, and Naomi Zack. This entry was posted	on Tuesday, October 13th, 2009 at 20:00Z	and is filed under Anthologies, Arts, Books, Identity Development/Psychology, Media Archive, Philosophy, Politics/Public Policy, United States. You can follow any responses to this entry through the RSS 2.0 feed. You can skip to the end and leave a response. Pinging is currently not allowed.